THE EISNER AWARD-WINNING "BEST DIGITAL COMIC" IS FINALLY AVAILABLE IN PRINT! 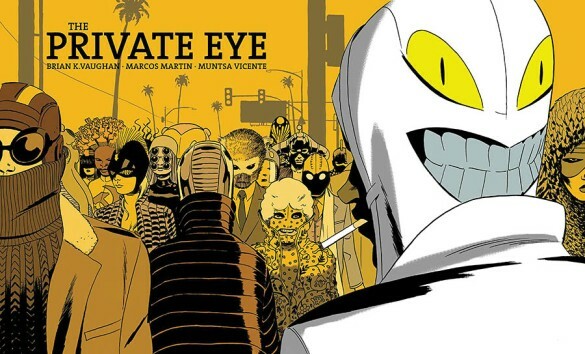 Because retailers, readers, and ROBERT KIRKMAN demanded it, the online sensation from PanelSyndicate.com’s BRIAN K. VAUGHAN (SAGA, PAPER GIRLS) and MARCOS MARTIN (The Amazing Spider-Man, Doctor Strange: The Oath) is finally coming to print with this gorgeous deluxe hardcover edition, presented in the story's original widescreen format! Years after the digital cloud “bursts” and exposes all of our worst secrets, THE PRIVATE EYE is set in an inevitable future where everyone has a secret identity. Following an unlicensed P.I. who is thrust into the most important case of his life, this sci-fi mystery explores the nature of privacy with frightening prescience.